WorkStraight helps you get work done! 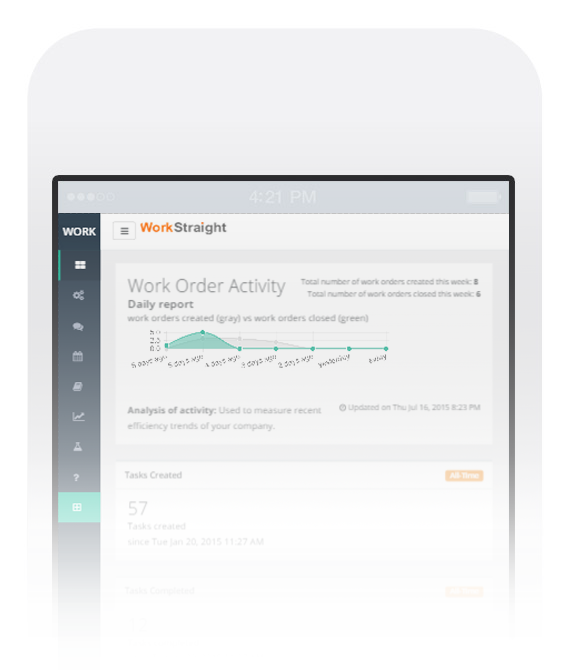 Create work orders, assign users, manage tasks, track progress, collaborate with your team, and empower your company with WorkStraight. 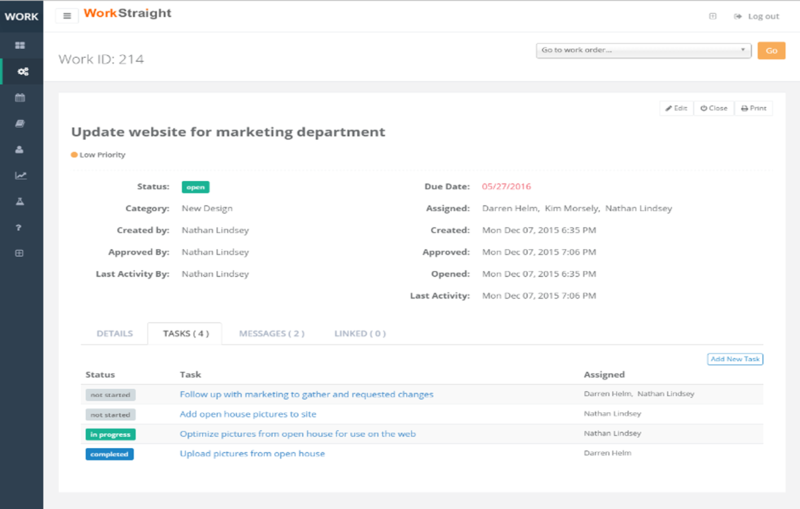 WorkStraight empower users to manage their workflow by creating clear lines of responsibility and communication. Full-featured and easy to use, it helps you get work done. 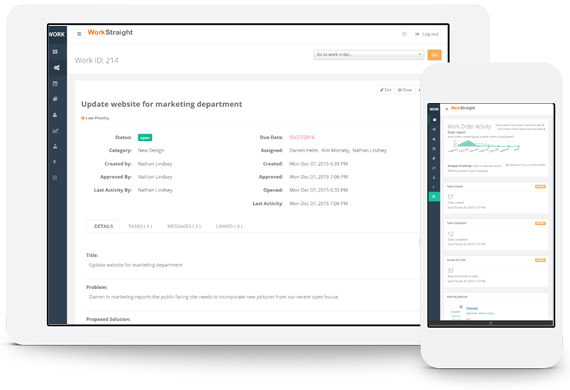 WorkStraight is software-as-a-service (SaaS), web based, customizable, and excels at managing work orders (or service requests, maintenance requests, or anything - YOU customize what they're called). Users can report on task progress, including hours worked and status. 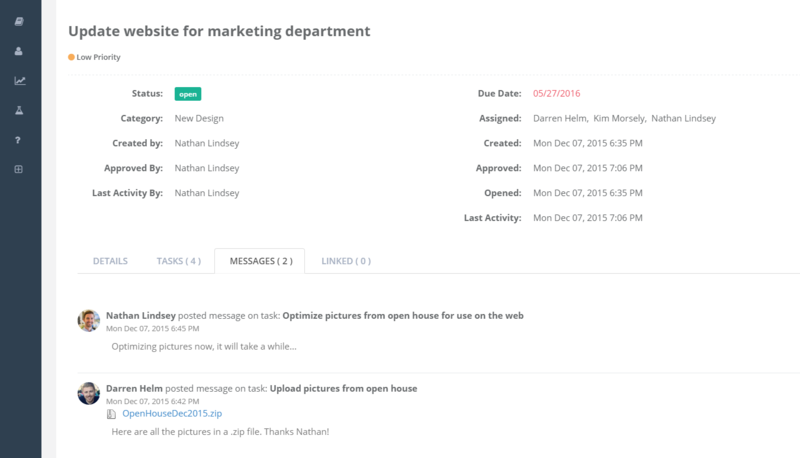 Easily link related work orders together and re-open closed work orders. Also, integrated calendar with email notifications helps to keep everyone up to date. Our work order software is perfect for a wide variety of tasks. Our work order software is easy to use, straightforward, and elegant. We know how important it is to easily integrate new tools into your workflow. WorkStraight gives you powerful tools in a user friendly interface. WorkStraight is natively mobile friendly and looks great in any browser. It also boasts a clean, easy to understand, and easy to use modern design. A powerful, yet simple interface, built on a flexible and customizable platform, that fits on any device. All of that coupled with SSL security and friendly support, promises to make WorkStraight an integral part of your team! Facility management, general contractors, software development, computer repair, construction, education, property management, real estate, hospitality, hvac, sales, janitorial, graphic design, health care, logistics, plumbing, government, call center operations, legal, auto repair, fitness, retail, transportation, media, non-profits, and many more. Use as a Saas web app, free work order software, work order management, and work order software. It's software, a work order system to create web based work orders. Also includes task management software, calendar, invoice, dispatch software, work order management, work order app, and maintenance software. Software that's great for general contractors, facility management, property management; or as a work order tracking system. It's the best work order software, free online work order software, free web based ticket system, and modern work order management software. Send service request, maintenance request, or collaborate. WorkStraight was started as a way to help people get things done - plain and simple. We are a small group of business-minded tech professionals, who believe that all businesses should be empowered to thrive and succeed.